Awesome. Love the burlap. Love the saying, perfect for a late card. too too cute. Awesome project. Thank you for sharing. Hope you have a great crafty day. Geeeee!! I can't say that I don't love him too :) GREAT HOP!! Very cute, love the papers you use. This couldn't be any cuter! Happy to be a new follower! Just the cutest yet. love him!! Your talent inspires me every time I enter into a blog hop. Fantastic Job! Love this little guy. Well done. Oh, I love this! The burlap is the perfect accent! This was a fun hop. I liked the board game format! Thanks for the chance to win. I'm crossing my fingers! AWE!!! He is sooo freaking cute!! love the scarecrow. the sentiment is great. i do tend to forget birthdays so this would be great. adorable!!! love the details and shading!! Cute! 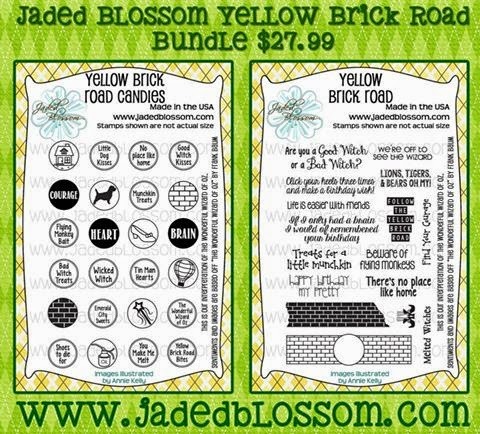 The Jaded Blossom sentiments are perfect for the Wizard of Oz. 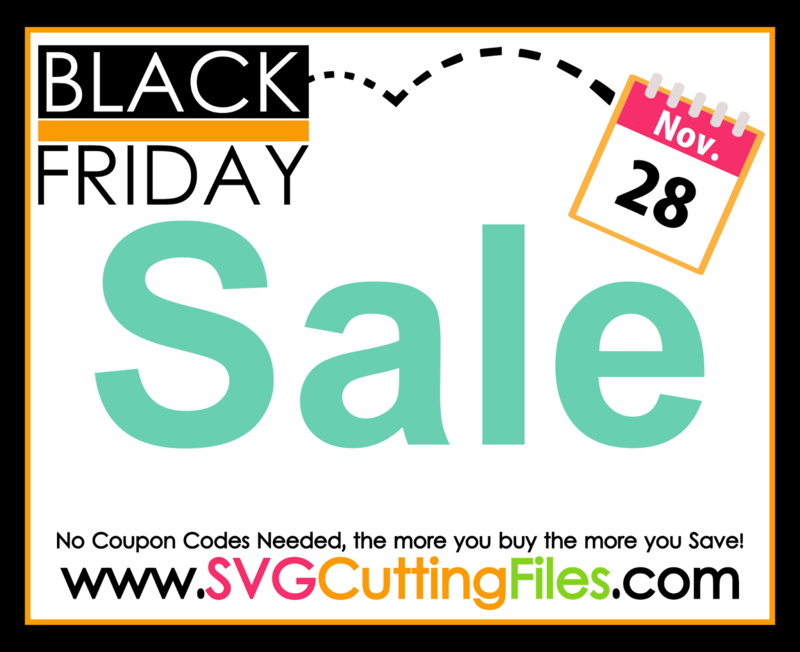 They go so well with all the cut files that have been demonstrated today. Love your project. The scarecrow is my favorite!! Thank you so much for sharing!! Love your scarecrow! This has been a fun hop! Love this card. and the verse is awesome. Love the use of burlap on this one! so cute and perfect sentiment! Love how perfectly the sentiments tie in with your craft. Awesome. thanks for the opportunity to make this cute file! Final stop but he is super adorable! 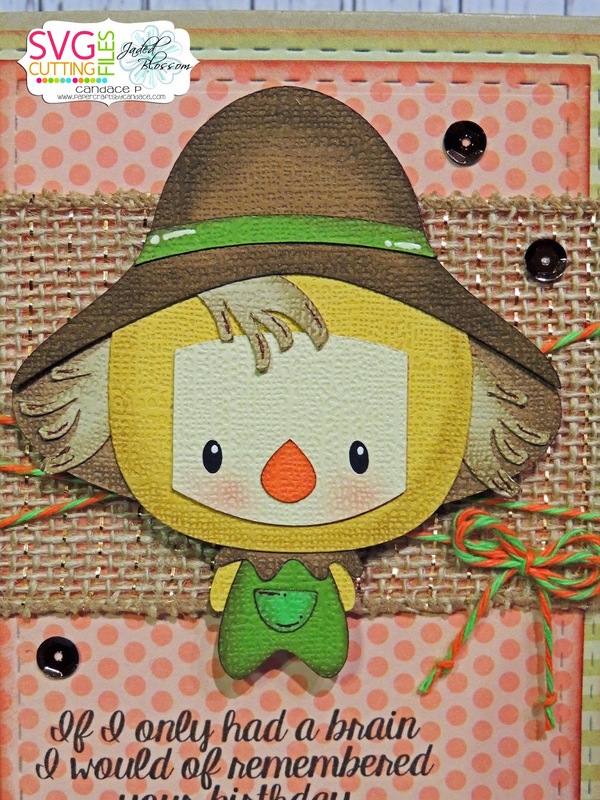 such a cute scarecrow!!! Loved this hop! 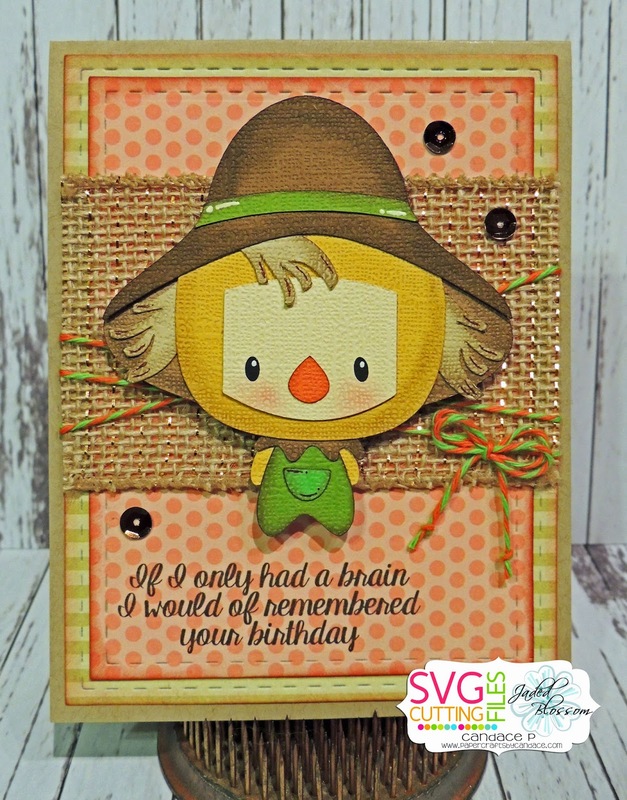 Love this card, the burlap is a great detail! such a cute project - just love it - I am overwhelmed with all the creativity!!! The Scarecrow is so sweet!! Adorable ~ love this guy!! Wonderful work. Love your added accents and shading. Oh my stars! This is why I need this set and files! That burlap and those sequins just make that card extra special. Thanks for a wonderful journey down memory lane and the yellow brick road! This is the cutest card. Absolutely love it!! That sentiment SO applies to me... 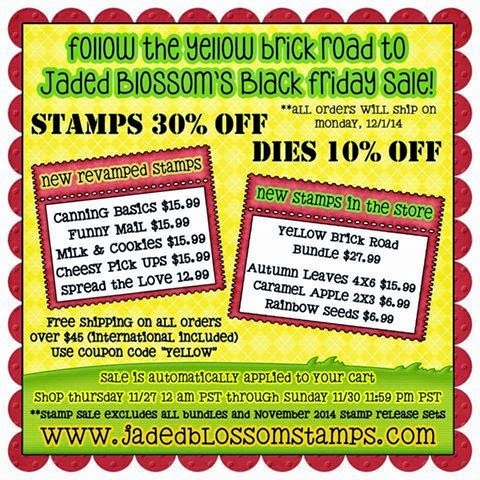 I forget to send cards ALOT! ;-) Love the sparkly burlap ribbon and all the details you added with the stiched panels, inking, and white pen. Love it!!! So super cute!!! Perfect belated birtday card! Love him. So cute I love all the detail! I love this sentiment and card. Great job! Another wonderful Hop! Such a cute card!! Thanks for another awesome hop!! You rock!! This is beyond cute! Thanks for all the lovely projects! Fun hop! Thanks for sharing! This is an amazing card! Love the burlap! Love it! love the sentiment!! what a cute little scarecrow! Oh my gosh!!! LOVE LOVE LOVE them!!! OMG! The CUTEST scarecrow EVER!! Awesome job! Love this scarecrow and sentiment. Just perfect. TFS.